If you are reading this, you probably need to collect information from your clients in order to start working with them. Whether you are a health practitioner, a lawyer or a fitness trainer, this intake process can involve some awkward methods, like faxing, editing word documents, printing-signing-scanning, and other 1998 ways of exchanging information. Getting away with these old fashioned methods is getting harder and harder, especially if you are trying to create a great first impression with your clients. Ask a millennial to print, sign, scan and return a document and be prepared to hear a sigh. In this article, I'm going to show you how to turn the boring and mundane intake process into an opportunity to wow your clients and make you look good. First, choose the tool that is right for the job. There are many tools like http://www.wufoo.com/ that do a great job of creating custom forms. However, you can go further and use something that was built specifically for intake forms and takes the whole intake workflow into account. One of this services is called IntakeQ and this is the one I'll be using to show you how easy it is to make your intake look amazing. So go to their website and create a free account. IntakeQ was built to optimize and enhance the intake process, while offering a great experience to your clients. Features like the ability to send secured forms privately, attach consent and agreement forms to it, request e-signatures from your clients, track and search completed forms, set it apart from generic forms. Add to that the fact that generic forms are not HIPAA compliant, and chooseing IntakeQ becomes a no-brainer. IntakeQ also offers a booking/scheduling widget that you can use on your website. This allows your clients to book and pay for their appointments online, and the icing on the cake is that your intake form is sent to them automatically. Once your account is created, it's time to create your first form. You can do it yourself let IntakeQ convert them for you. For the sake of this post, let's pretend we don't have an existing form and create one from scratch. Creating a new form is very simple. Just click on "Create New Form" and you'll be asked to give it a name. Once you name your form, you'll be presented with the form editor. If this is your first form, you’ll see a nice little tour that will show you around this screen. Here you have 2 ways of starting. You can create a question from scratch or import questions from a question library that contains hundreds of common intake questions grouped by category. Let's do that first. Click on "Browse pre-existing questions", select your field (nutrition, counseling, naturopath, etc) and look through the questions available. 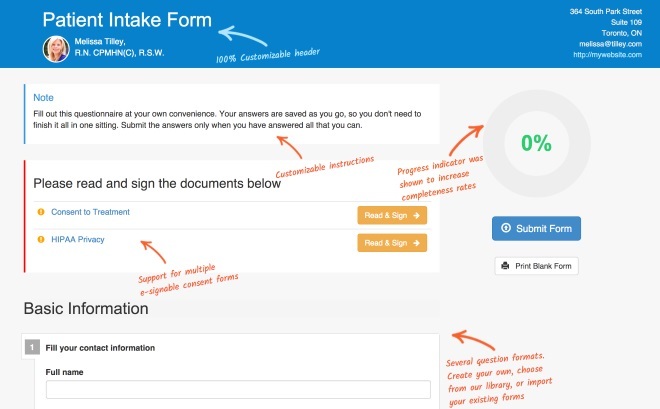 Use the checkbox at the top right corner of each question that you want to see in your form. Remember, you'll be able to edit them after they are imported. Once you are done selecting your questions, click on Import Questions. This will lead you back to your questionnaire page, which now contains the imported questions. At any time you can click on the Preview button in the toolbar to see how your form will look to your clients. To tweak the questions you imported, just select a question on the left panel and its contents will show up on the right panel. If you want to create a question from scratch, you can select between several question types, like short answer, long answer, multiple choice, matrix, etc. Hover the mouse over the "example" word and you'll see what each type looks like. Finally, lets add e-signature to our form. Locate the checkbox at the bottom of the left panel that says "Enable e-signature" and make sure it's checked. Once you're happy with your questions, it's time to get them to your clients. There are two ways to accomplish this and which one is better for you depends on your field. The first way is to integrate the form with your website. If you're okay with your forms being open on the internet, that's probably the best choice, because you can just instruct your clients to go to your website and fill them out. Once a client submits it, you'll receive an email notification telling you that the form was submitted. You can then log into IntakeQ and see the details. The other way to have your clients fill out the form is to send it to them privately. Using this method, your client will receive an email containing a URL and a passcode to login. your client won't be required to fill out the form in one sitting. Their answers are saved as they go and when they need to get back to them, they just need to click on the email URL again. 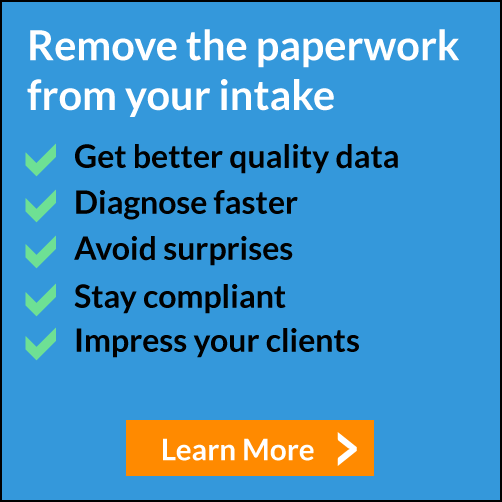 Sign up for our free trial and start using e-forms with your patients today.